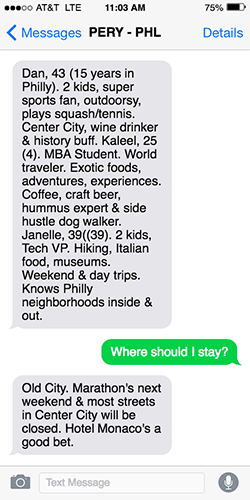 We're like that awesome friend who can answer all your travel questions. 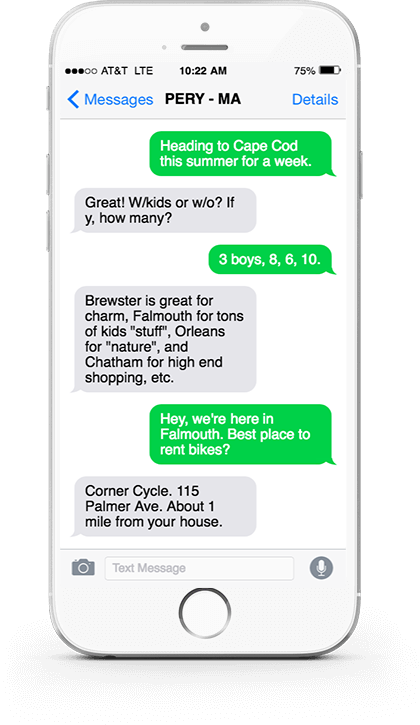 AskPery lets you text local experts any questions you have about an upcoming or current trip. What neighborhood should I stay in? Is the Art Museum kid friendly? What is the easiest way to get to the Warriors game tonight? "Was totally overwhelmed planning a family trip to DC. PERY simply pointed me in the right direction and got me going. Had never been and didn't know where to start. Few texts later, I had my hotel picked out and the first few days mapped out." 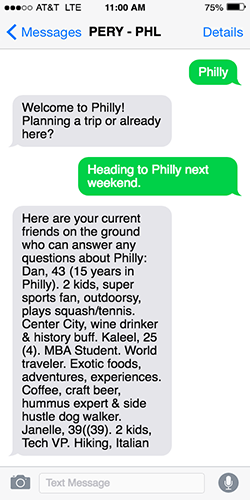 "Saved me probably 20 hrs of wasted time for a school visit to Philly with my family. Easily the quickest way to get answers. 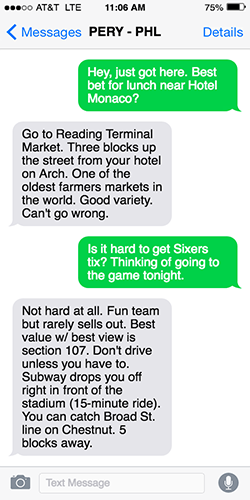 Told us where to park, where to get tickets for the Sixers game, what lines to skip and where to get a real cheesesteak." "Landed in DC for a recent conference. Had no clue what to do, where to eat, etc. Within 5 minutes, had a dinner spot picked out and recommended the Portrait Gallery near my hotel. Probably would've spent more than an hour figuring that out on my own." Made with by the Pery Team 2017.